In 1967, Bohler  for the first time reported the use of anterior cervical plate and screw fixation. Since then, there has been an immense increase in the number and the types of anterior cervical fusion with plating systems for various pathologies like trauma, cervical disc, cervical spondylotic compressive myelopathy, ossification of the posterior longitudinal ligament, and spinal infections. , In spite of the refinements in the plating system and designs, incidence of dislodgement of plate and screw pullout is still seen, but migration of plate and oral extrusion of screw during taking food is very rarely reported. A 54-year-old gentleman with cervical compressive spondylotic myelopathy and multiple congenital anomalies of the cervical spine such as cranio-vertebral junction anomaly with occipit-C1 synostosis and C4-C5 fused vertebrae [Figure 1] underwent C3 median corpectomy, gardening, iliac crest graft placement, and stabilization using titanium plate and screws from C2 to C4 vertebral bodies [Figure 2]. Postoperatively, he had improvement in his symptomatology. He reviewed after 8 years with complaint that a screw had expelled through his mouth while having food. There was history of progressive difficulty in swallowing with occasional regurgitation of feeds of 2 months duration. He had no history of recent trauma or worsening of power in his limbs. He was conscious and his neurological examination was normal except for exaggerated deep tendon reflexes. On oral examination, there was a defect in the posterior pharyngeal wall, through which cervical plate along with a missed fixation screw and intact self-locking screw was seen [Figure 3]. 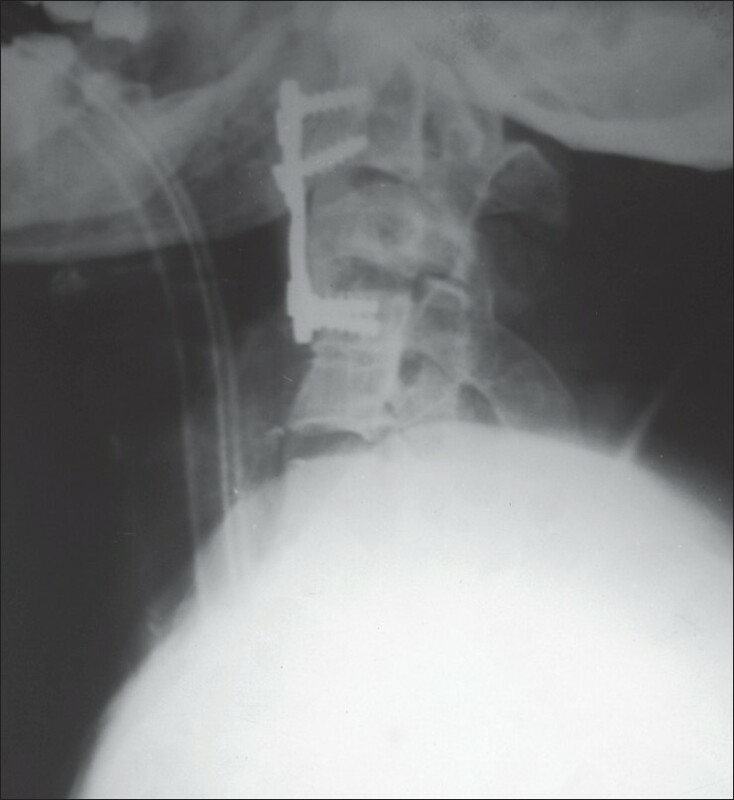 X-ray cervical spine lateral view showed anterior dislodgement and migration of the plate with a missing screw socket [Figure 4]. Oral culture was taken, and he was started on intravenous antibiotics, betadine oral gargles, and was fed through a nasogastric tube. At resurgery, no abnormal movement was seen, but the plate and screw system was loose and had migrated, with no evidence of fracture of the plate system. The plate was removed in toto after removing the screws [Figure 5]. As the patient had no new neurological deterioration and no abnormal movement was seen intraoperatively, no further instrumentation was done. He was planned for posterior fusion in case he developed new neurological deficits or signs of instability. Postoperatively there was no injury to the peripheral nerves or cranial nerves. Since the posterior pharyngeal wall defect was small, it was expected to close over a period of time; hence, no attempt was made to close it. Postoperatively he was continued on nasogastric tube feeding and intravenous antibiotics for 2 weeks. Regular inspections were made at the posterior pharyngeal wall to rule out fistula formation. The posterior pharyngeal wall defect had closed by 3 weeks without any gaping/fistula formation. At 11 months of follow-up, the patient is asymptomatic with normal lower cranial nerves' function and with no signs of instability or new neurological deficits. Though anterior cervical plating seems to be a straightforward procedure, it can be associated with complications like recurrent laryngeal nerve injury with hoarseness of voice, cerebrospinal fluid leakage, quadriplegia, worsening of the paresis, perforation of the soft tissue structures like the esophagus, screw pullout, and migration of plate and screws, and even death has been reported. ,, Very rarely aspiration pneumonia, carotid artery injury, abscess formation, mediastinitis, systemic sepsis, pleuritis, fistula formation, and gastrointestinal complications following oral extrusion of the screw or plate system have been documented. ,,, All these complications can be attributed to the complex anatomy of the anterior cervical region, improper patient selection, and poor surgical techniques. Lowery et al. reported failure rate of 35% in patients who underwent anterior cervical plating surgery, of which 7% cases underwent resurgery. Zeidmann and his colleagues estimated an overall complication rate of 5% with anterior cervical spinal fusion surgery. Dislodgement of cervical plate with migration and oral extrusion of screw has been rarely reported in the literature. Such complications have been reported from as early as 1958, when Smith and Robinson  reported a case wherein the graft and the whole plate system device had extruded through the gastrointestinal tract. One of the complications of cervical plating system is screw pullout. There are only two cases of oral extrusion of the screw following surgery. Geyer et al. have reported oral extrusion after 5 years of surgery without any evidence of plate dislodgement, which was managed conservatively. Lee et al. have reported an oral extrusion of cervical plate screw after 15 months following surgery, which was again managed conservatively. Our patient presented after a period of 8 years with oral extrusion of screw, and on radiography, there was evidence of migration of the plate system and missing screw. Ours is the only case where following oral extrusion of the screw, surgical intervention like removal of the implant system was required, as there was associated plate anterior dislodgement. Screw pullouts were associated with esophageal or posterior perforation with asymptomatic passage of implants through the gastrointestinal tract. ,, Our patient also had posterior pharyngeal wall perforation, through which the screw had extruded out. The causes for posterior wall perforation can be iatrogenic injury or over vigorous retraction causing delayed local vascular complications. The chronic compression due to the protruding plate and screws over the posterior wall of the pharynx may lead to focal ischemia and necrosis and perforation, as seen in our patient. Patients generally present with the complaint of difficulty in swallowing, pharyngeal pain and swelling, neck pain, loss of weight, dysphonia, subcutaneous emphysema, fever, or worsening of the neurological status, ,,,, as in our patient who presented with swallowing difficulty and regurgitation of feeds, with no evidence of lower cranial nerve paresis. The treatment of instrumental failure depends on the severity of the problem, the patient's general condition, and the presence of complications. Initial management includes elimination of oral feeds, nasogastric tube feeding to restore fluid and nutritional balance, betadine mouth gargles, and intravenous antibiotics, as per the culture sensitivity report. There are reports of conservative management in cases of the screw pullouts with no dislodged plate. The indications for hardware removal were mainly persistent dysphagia or loosening of implants beyond 5 mm. In our patient, the plate system has dislodged more than 5 mm and migrated with perforation of the posterior pharyngeal wall. Hence, our patient underwent resurgery and removal of the plate system. As the posterior pharyngeal wall defect was small and was expected to heal spontaneously, no repair was done. Surgical repair using sternocleidomastoid or pectoralis major flap repair ,,, is indicated when the defect is large or when spontaneous healing fails. Postoperatively there can be chances of developing new neurological deficits due to hypoglossal nerve injury or damage to superior laryngeal nerve when re-operating at high cervical levels. Postoperatively antibiotics are given for 2 weeks and feeding should be through a nasogastric tube for 2 weeks, allowing sufficient time for the sutures to heal. 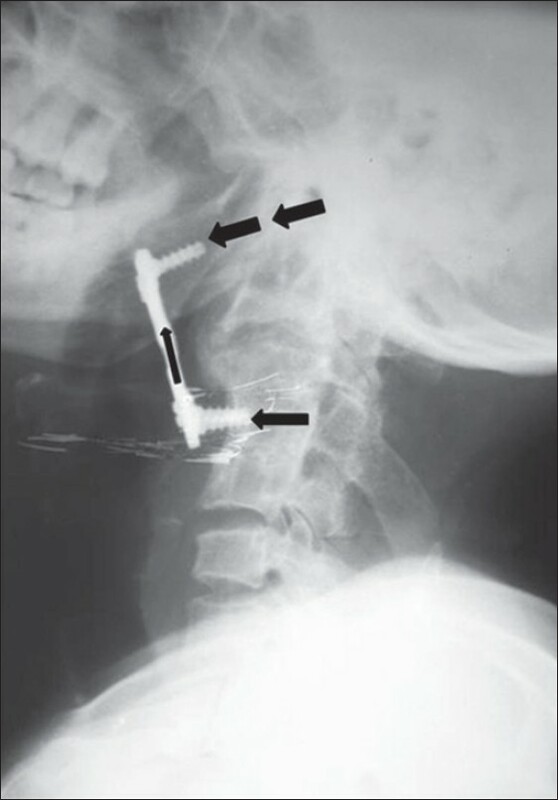 We report a very rare case of late-onset (8 years) dislodgement, migration, and oral extrusion of fixation screws with intact locking screw, after anterior cervical spine plating. Associated congenital anomalies of cervical spine can exaggerate the chances of implant failure. In patients who present late with swallowing difficulty or regurgitation of feeds following anterior plating surgery, a clinical suspicion of screw pullout or plate dislodgement (though very rare) should be considered and evaluated for appropriate management. 1. Bohler J. Immediate and early treatment of traumatic paraplegias. Z Othop Ihre Grenzgeb 1967;103:512-29. 2. Cloward R. Treatment of acute fractures and fracture dislocations of the cervical spine by vertebral body fusion. A report of 11 cases. J Neurosurg 1961;18:205-9. 3. Smith G, Robinson R. The treatment of certain cervical- spine disorders by anterior removal of the intervertebral disc and interbody fusion. J Bone Joint Surg 1958;40:607-23. 4. Burton CV. Failed back surgery patients: The alarm bells are ringing. Surg Neurol 2006;65:5-6. 5. Lowery GL, McDonough RF. The significance of hardware failure in anterior cervical plate fixation: Patients with 2 to 7 year follow-up. Spine 1998;23:181-7. 6. Schultz KD Jr, McLaughlin MR, Haid RW Jr, Comey CH, Rodts GE Jr, Alexander J. Single-stage anterior-posterior decompression and stabilization for complex cervical spine disorders. J Neurosurg 2000;83:214-21. 7. Gaudinez RF, English GM, Gebhard JL, Donaldson DH, Brown CW. Esophageal perforations after anterior cervical surgery. J Spinal Disord 2000;13:77-84. 8. Vrouenraets BC, Been HD, Brower-Mladin R, Bruno M, van Lanschot JJ. Esophageal perforation associated with cervical spine surgery: Report of two cases and review of the literature. Dig Surg 2004;21:246-9. 9. Talmi YP, Knoller N, Dolev M, Wolf M, Simansky DA, Keller N, et al. 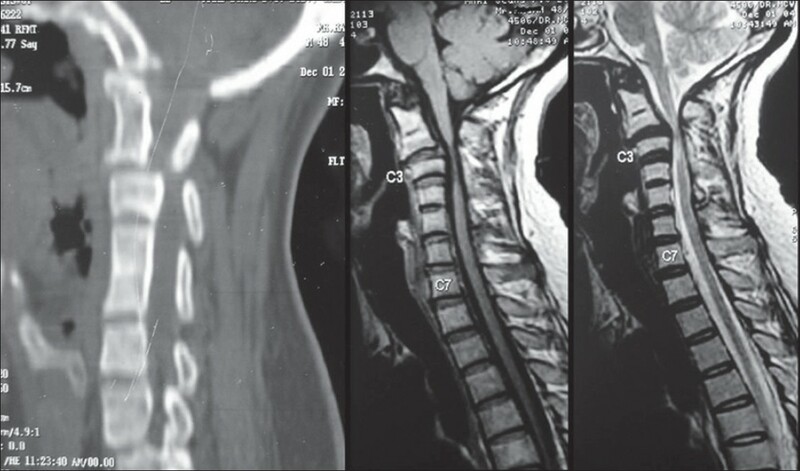 Postsurgical prevertebral abscess of the cervical spine. Laryngoscope 2000;110:1137-41. 10. Wong TD, Fehlings MG, Massicotte ME. Anterior cervical screw extrusion leading to acute upper airway obstruction. Spine 2005;30:E683-6. 11. Zeidman SM, Ducker TB, Raycroft J. Trends and complications in cervical spine surgery: 1989-1993. J Spinal Disord 1997;10:523-6. 12. Defino HL, Néri OJ, Shimano AC. Anterior C2-C3 fixation with screws: Proposal of a new technique and comparative mechanical assays. Eur Spine J 2006;15:1159-64. 13. Traynelis VC, Fontes RB. Anterior fixation of the axis. Neurosurgery 2010;67:229-36. 14. Geyer TE, Foy MA. Oral extrusion of a screw after anterior cervical spine plating. Spine 2001;26:1814-6. 15. Lee HC, Hee HT, Wong D. Oral Extrusion of a Cervical Screw 15 Months after Anterior Cervical Spine Plating Hong Kong. J Orthop Surg 2004;8:127-31. 16. Fujibayashi S, Shikata J, Kamiya N, Kamiya N, Tanaka C. Missing anterior cervical plate and screws: A case report. Spine 2000;25:2258-61. 17. Pompili A, Canitano S, Caroli F, Caterino M, Crecco M, Raus L, et al. Asymptomatic esophageal perforation caused by late screw migration after anterior cervical plating: Report of a case and review of relevant literature. Spine Spine (Phila Pa 1976) 2002;27:499-502. 18. Yee GK, Terry AF: Esophageal penetration by an anterior cervical fixation device. Spine 1993;18:522-7. 19. Fountos KN, Kapsalaki E, Machinis T, Robinson JS. Extrusion of a screw into the gastrointestinal tract after anterior cervical spine plating. J Spinal Disord Tech 2006;19:199-203. 20. Hollowell JP, Reinartz J, Pintar FA, Morgese V, Maiman DJ, et al. 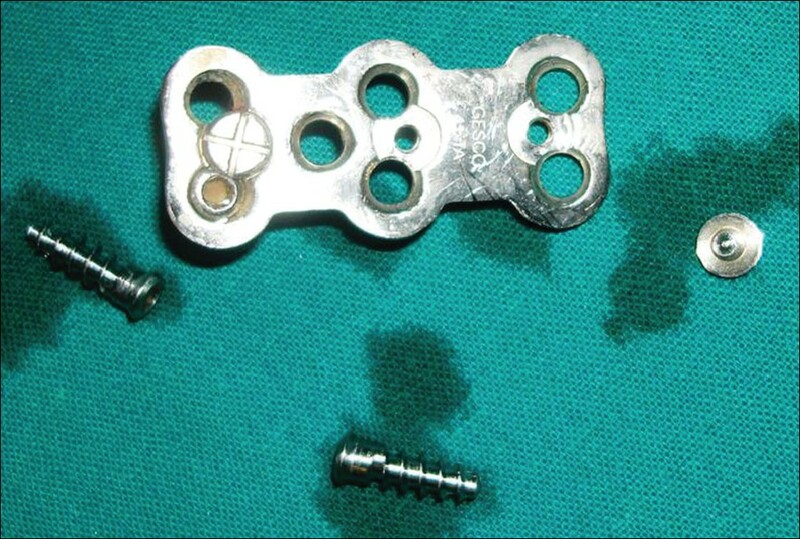 Failure of Synthes anterior cervical fixation device by fracture of Morscher screws: A biomechanical study. J Spine Disord 1994;7:120-5. 21. Riew KD, Sethi NS, Denvey J, Goette K, Choi K. Complications of buttress plate stabilization of cervical corpectomy. Spine 1999;24:2404-10. 22. Lee JS, Kang DH, Hwang SH, Han JW. Oral Extrusion of Screw after Anterior Cervical Interbody Fusion. J Korean Neurosurg Soc 2008;44:259-61. 23. Papanastassiou ID, Baaj AA, Dakwar E, Eleraky M, Vrionis FD. Failure of cervical arthroplasty in a patient with adjacent segment disease associated with Klippel-Feil syndrome. Indian J Orthop 2011;45:174-7. 24. Navarro R, Javahery R, Eismont F, Arnold DJ, Bhatia NN, Vanni S, et al. The role of the sternocleidomastoid muscle flap for esophageal fistula repair in anterior cervical spine surgery. Spine 2005;30:617-22. 25. Pichler W, Maier A, Rappl T, Clement HG, Grechenig W. Delayed hypopharingeal and esophageal perforation after anterior spinal fusion. Spine Spine (Phila Pa 1976) 2006;31:268-70. 26. Sharma RR, Sethu AU, Lad SD, Turel KE, Pawar SJ. Pharyngeal perforation and spontaneous extrusion of the cervical graft with its fixation device: A late complication of C2-C3 fusion via anterior approach. J Clin Neurosc 2001;8:464-8. 27. Ayed AK, Al-Din HJ, Asfar SK. Reinforced primary repair of early distal oesophageal perforation. Eur J Surg 2000;166:938-41. 28. Cloward RB. Complications of anterior cervical disc operation and their management. Surgery 1971;69:175-82.